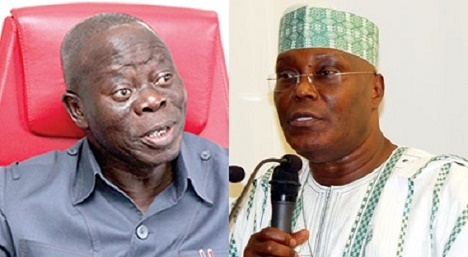 The National Chairman of the ruling All Progressives Congress, Adams Oshiomhole, has said the party is ready to meet the Peoples Democratic Party’s presidential candidate, Alhaji Atiku Abubakar, in court. Atiku had at a press briefing where he rejected the result of the February 23 presidential election on Wednesday, indicated his intention to challenge it at the election petitions tribunal. According to him, the election was manipulated in favour of the APC, saying voters in his strongholds were denied voting. But in a response to the allegations, Oshiomhole at a press briefing on Thursday in Abuja said he was convinced that the election reflected the will of Nigerians despite pockets of violence recorded in some parts of the country. He said it was sheer arrogance for Atiku to have said Nigeria’s future was tied to his presidency. “Was he going to rule Nigeria against our wish? Citizens must hold their leaders accountable to their policy choices. Even, when he said if he would die, he would sell the NNPC; many people believed that he has collected deposit. “It borders on arrogance for Atiku to suggest that our future is tied to his presidency. Atiku is destined never to be president of Nigeria. Leadership is about character. Atiku’s desperation is so obvious, so desperate that in 2003, he challenged his own boss, former President Olusegun Obasanjo, not to do a second term,” he said. Oshiomhole said he deliberately refused to say the election was perfect because the APC was rigged, especially in the South-South in connivance with some INEC’s ad hoc staff and backed by some Resident Electoral Commissioners, whom he accused of working against the APC. He said in one of the APC’s strongholds in his local government, INEC members of staff deliberately mutilated result sheets to the point that it was unacceptable and over 5,000 votes were cancelled in the process. According to him, the REC rejected a request for a fresh tabulation to accommodate results collated from the polling unit level. He said the manipulation allegedly aided by compromised INEC workers was responsible for the loss of the senatorial bid of Senator Godswill Akpabio. He stated that his party had compiled several petitions to INEC on the irregularities. Oshiomhole said, “Rather than Atiku saying that rigging has come to stay, and why the numbers don’t add up in the absence of massive rigging, I just think that he needs to be reminded the essence of our collective efforts with all those that I can describe as genuine friends of Nigeria, to improve the electoral process. “We have petitions that we have written to INEC on how we were rigged out in Akwa Ibom State. It is interesting that it is the PDP that is complaining about the outcome of election in Akwa Ibom State.